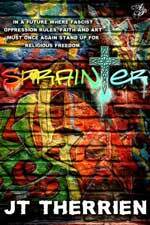 Think Escape from New York meets the Holy Bible and you have Sprainter by JT Therrien. MrE and his fellow graffiti artists or “sprainters” (get it, because they paint with spray paint? I didn’t either at first) are struggling to live by their own morals and beliefs in a world where it is simply against the law. There’s rumors of a plague and that the city was cordoned off and isolated because of it, but then a tyrant took over “Tronno” and regulated access to the resources and comforts the city once enjoyed. School classes are all about the tyrant and religion has been banned. The sprainters are bucking the system and are very cool with catchy names and styled in a way that will appeal to a teen audience—fishnets, piercings and funky hair. They live in a commune situation separated from their parents (by choice or, in MrE’s case, because they don’t know where their parents are) and monitored by a priest known as Father. MrE has a secret benefactor who sponsors his art, but most kids rely on their wits to help bring food back to the commune to share. Relying on oneself 101. As an avid reader I saw many of the plot twists coming. Religious persecution is overriding the plot as it in the mind of many people I know who identify themselves as Christian. My own mother goes on about World War III and how she thought the rapture would happen before. She now knows it won’t, so that those folks who are religious will be made to suffer by their government. Therrien’s entire story felt like a metaphor for where the church is heading and if the author was American and not Canadian, I’d think the use of the phrase “Don’t ask, don’t tell” which was once so iconic of gays in the military would be a purposeful nudge leading the reader to look toward the current leadership of the country and his own supposed religious beliefs. I won’t get into my own politics and beliefs in this review except to say the lightly veiled references and clear symbolism made me read the novel just a bit differently. Overall, Sprainter was a good story. At 104 pages long it neither belabors nor cuts short the rather direct story line of a tyrannical society and repressed religion. What we’re left with is a very cool story that young adults 12-14 (probably older as well) will love even if they (or their parents) are not religious types. At the end of the day Sprainter is a well-written, well-plotted story of rebels with a cause and who wouldn’t like that? For more information about J.T. Therrien and his work, visit his blog. You can connect with him on Goodreads, Facebook, Pinterest, Google+ and Twitter @JTTherrien.